You have to stop viewing distillers/producers as anything other than businesses. Admittedly, this is tough to do for the new whiskey hobbyist or rookie blogger opening his freshly delivered sample, but very easy for jaded, miserable wretches like myself. And businesses make business decisions without much consideration to the hurt feelings of the bloggers. It’s the reality. Accept it, love it, live it. Because if you haven’t noticed, they don’t give much of a sweet good golly about the loudest voices against them in this debate, nor should they (sorry). Of course there has been a dab of creative marketing, maybe even some deception, but people are willing to buy NAS bottlings and pay lots of money for them. Therefore, you are rendered powerless for the time being. And not all NAS bottlings are that bad, either. I suggest a new mindset, one which we as a club use: judge an NAS bottling just like any other on the shelf and vote with your dollars, for this voice is the most powerful. If you believe that the whisky isn’t worth the price tag, do not buy it, and be calmly vocal about it. There is always another brand out there that’s better and cheaper to fill the recently gouged hole in your life. Bloggers don’t have the voice we think we have, so don’t yell even louder, please. I’m not sure anyone but yourselves care enough. 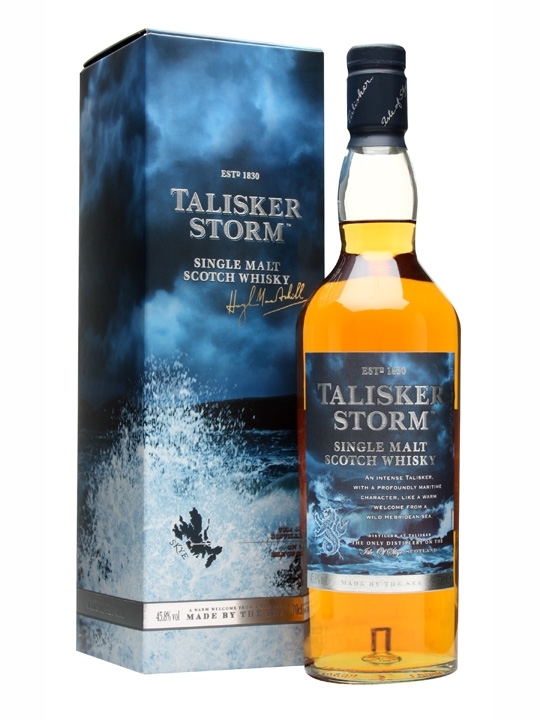 So now that we got that out of our way, and possibly burned a few more bridges to add to our list, let’s talk about Talisker Storm before the bloody sun sees tomorrow. Whisky writer Dave Broom once wrote that Talisker distills itself. I’ve never been to the Isle of Skye, but the place must smell like sea spray, smoke, oysters and brine. We have reviewed the 10 year old to fine results, and were eager to find out how different Storm could be being that the age statement went away and on top of that plus a price tag slightly more, say, robust. Storm is comprised of stock from as young as 3 years old up to 25 years old in a mix of re-filled, re-charred casks. They say Storm is supposed to be bigger, smokier, and spicier than the 10. Fine. Nose- Sea spray on a beach with a bonfire. Honey. Oysters with ripe apricot and melon rind. Briny and big. Warm biscuit with a hint of toffee/vanilla. Leather polish. Taste- Like the nose but with more fruit sweetness. Weighty. Finish- Smoky and peppery punch on the way out. Dry herbal notes. Medium to long length. Comment – Fairly solid malt that is indeed bigger and badder than the 10, but we are split on the value for money compared to other malts in this price range.